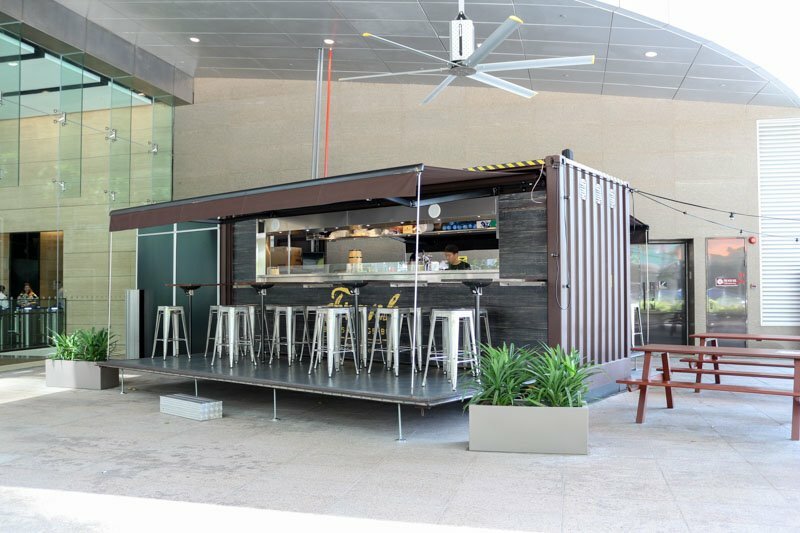 I know we have container parks like Timbre+ and Punggol East, but it’s hard to imagine a container eatery in the heart of Singapore due to space constraints. FRANK solved that issue by turning the container into the kitchen itself and setting up chairs around the container for dine-in guests. At the heart of it all though, FRANK is a takeaway container concept, serving different hotdogs inspired by countries like Japan, Korea and even Singapore. 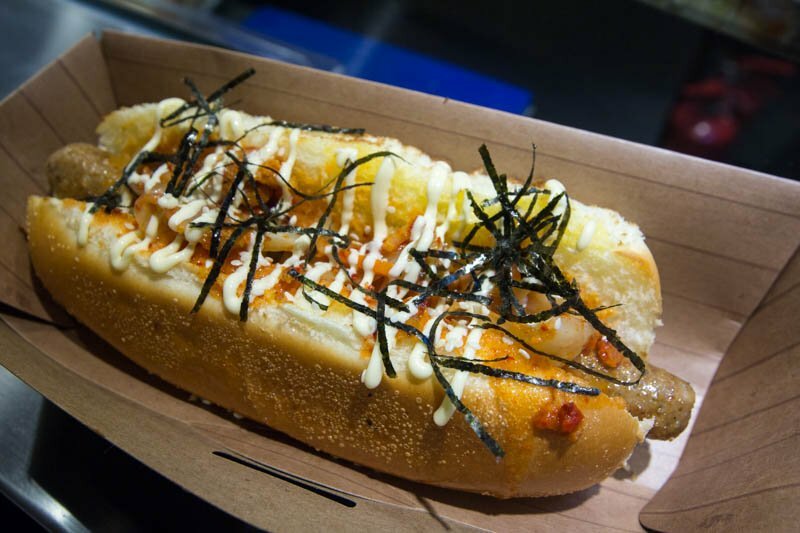 The K-Dog ($11) is a homage to the ubiquitous food item of Korea, kimchi. A soft bun is filled with a Kurobuta pork sausage before being topped with a mound of kimchi and a spicy-sweet glaze. The sausage casing provided a nice crunch while the sausage meat itself was tender and paired well with the spiciness of the kimchi. The only fault that I could find with this hotdog was that the moisture from the kimchi soaked through the bun, resulting in the once-fluffy bun turning soggy if you leave it for too long. 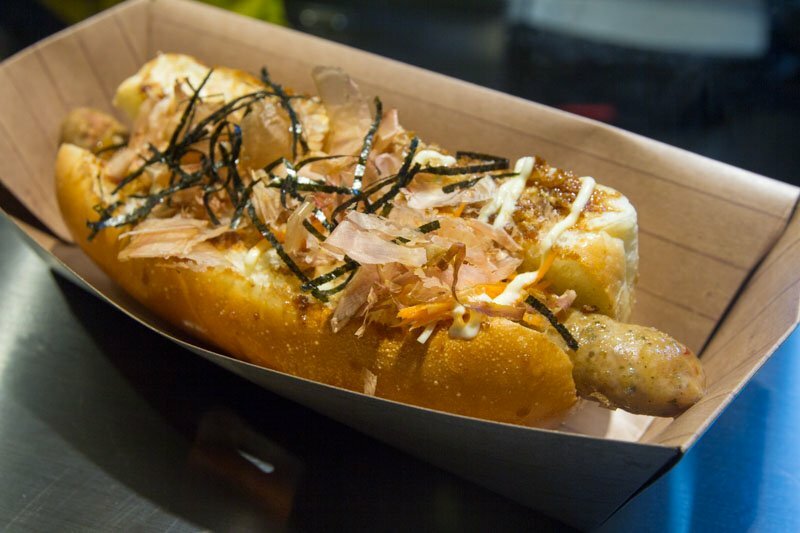 For fans of Japanese cuisine, the Tokyo Frank ($12) is something not to be missed. The combination of sweet and savoury from the teriyaki glaze and bonito flakes was perfect, with neither overpowering the other. There was also a nice crunch and freshness from the daikon with miso dressing to round out the dish. 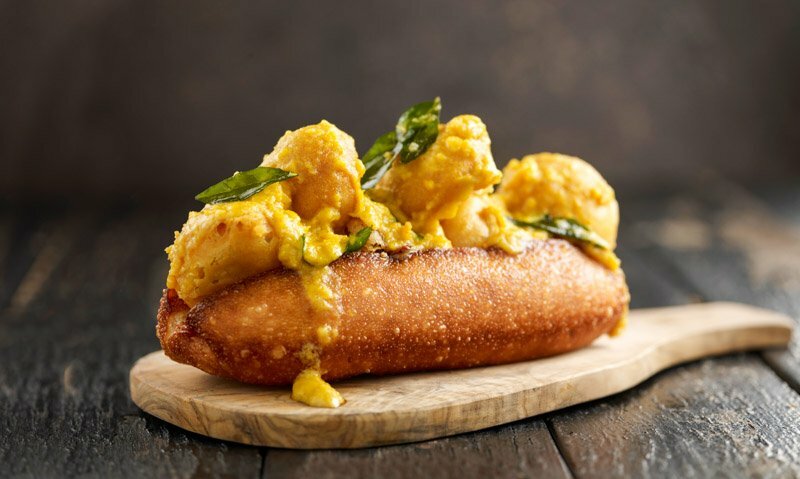 My favourite had to be the Singapore-inspired hotdog though, the Salted Egg Frank ($15), which uses batter-fried squid balls as a sausage replacement, sandwiched in a deep-fried mantou bun which I absolutely loved. The bun had a crispy exterior and a fluffy interior and was definitely reminiscent of the mantou buns that one would dip in chilli crab sauce. The squid balls had a slight spice to them, but I thought that the salted egg sauce would do with a bit more frying time to bring out the fragrance of the curry leaves further. Currywurst is one of the most popular sausage dishes from Germany, so it only makes sense for a hotdog eatery to offer this. 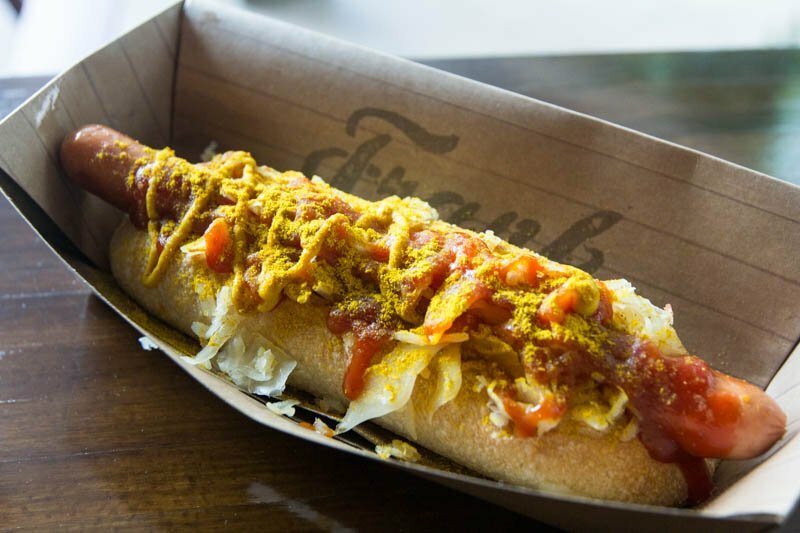 The Curry Dog ($15) is a dinner special only, served with a glass of German beer that’s exclusive to FRANK and Brotzeit. With a firmer white roll bun and crispy bacon, this hotdog is definitely a winner in my books. There was sweetness from the curry ketchup, but I found that the curry flavour was a bit subdued. Despite that, this hotdog is probably one of my favourites thanks to the addition of sauerkraut which gave it a tangy bite. Cool off with a bottle of Punchin’ Rye ($12) from Rye & Pint Brewery after your meal; I found that I preferred this over the Lowenbrau beer due to the strong passionfruit notes and the slight hoppy aftertaste that wasn’t too bitter. 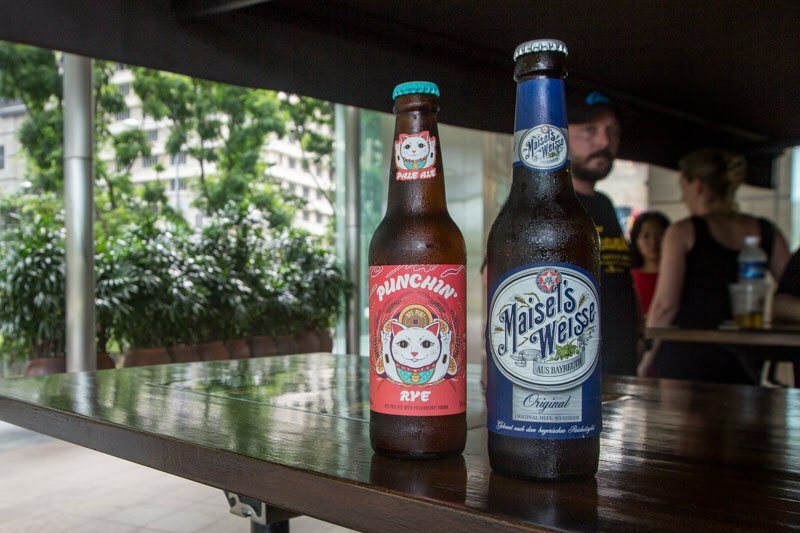 This local brewery owned by three brothers churns out beers at Tuas, so this is a must-try for the supporters of local beer. If you’re looking for a quick takeaway meal around Marina Boulevard, FRANK is definitely a place to check out. With great food, ice-cold beers and a view of the Marina Bay, this is where I would choose to chill with my friends after a long work day.